In this seminar we shall discuss the chapter titled Time and History extracted from the Italian philosopher’s Giorgio Agamben early book titled Infancy and History (pp.87-105). What is time? (and in this we shall ask, too, what is the Architect’s time?) This is a relatively obvious question that we however rarely encounter, yet occasionally think of. If asked in this manner the question will lead, each time, to a particular type of an answer (which can take various forms, while it remains essentially the same as we shall perhaps discover in our discussion). How is time? This may be a better question, and we shall see what that kind of raising of the question may mean for the way in which we think of time. In doing so and in following the reading closely we shall particularly interrogate the so-called Western understanding of time in order to locate its problem. What is the problem, if it is one, that ‘time’ is invented to solve? How to think of time? What happens if we venture outside of this logic or structure of problem-solution? Let’s find out. Please read the set text prior to the seminar and bring with you notes and questions. This will essentially be a reading discussion with a very short presentation during the last third of the session. 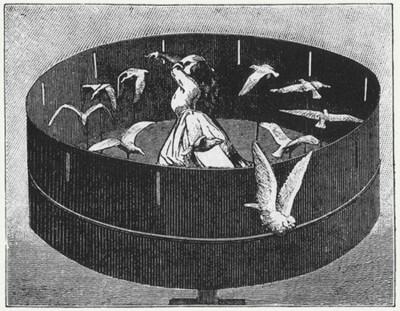 Image: Max Ernst, Rêve d’une Petite Fille qui Voulut Entrer au Carmel, 1930. Collage.